Floods have engulfed eastern Romania, causing 7 deaths and prompting nearly 1,400 people to evacuate their homes. Five people were reported dead on Thursday, and two more on Friday, Interior Ministry official Victor Dobre said, without giving details. More than 1,000 houses have been flooded, and almost 1,400 residents were evacuated after days of heavy rain in eastern Romania. Traffic resumed on main roads Friday, but smaller country roads were still waterlogged, Dobre said. The floods hit four counties and caused flooding in 47 towns and villages. Worst hit was the town of Tecuci, 180 kilometers (112 miles) northeast of Bucharest where a 74-year-old woman was found dead in the ruins of her collapsed house and an 83-year-old was swept away by flood waters after 24 hours of heavy rain. 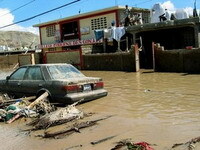 Food and water has been distributed to stricken residents, Dobre said. Flooding also affected Austria, where authorities issued flood warnings in the country's north and west on Friday after the Danube River and other waterways burst their banks. In Lower Austria province, the Danube's water levels reached a 20-year high, and officials were asking some residents in low-lying towns near the border with Slovakia to leave their homes and move to higher ground as a precaution.